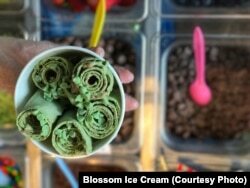 Thai-Style 'Rolled Ice Cream' Getting Popular in U.S. The weather in the Northern Hemisphere may be getting cooler, but there is still time left to enjoy frozen desserts typical of summer. One of the most traditional warm-weather treats is ice cream -- a frozen mixture of cream, sugar, milk and flavorings. Many people believe the dessert first became popular in the United States after the wives of early presidents served it in the White House. According to the White House Historical Association, Dolley Madison, the wife of President James Madison, served ice cream there for the first time. That was in the early 1800s. But ice cream has changed a lot in the last 200 years. And now, a new style of ice cream that started in Southeast Asia is spreading in the United States: rolled ice cream. Matcha Melody rolled ice cream is made with matcha, strawberries and mint chips. This summer, rolled ice cream could be found at street festivals from New York City to Nashville, Tennessee. At Sweet Charlie’s, a store in Philadelphia, customers often wait in line for over two hours to order their rolled ice cream. Some people call it “Thai stir-fried ice cream.” That is because it looks like it is made on a hot grill, in the same way people cook meat and vegetables. But the grill used for making the treat is actually extremely cold. The ice cream “chefs” add things like cookies, candy, and even pizza into the ice cream mixture. Then, the ice cream begins to freeze. Next, the chef spreads it in a thin layer over the cold surface. After a few seconds, the chef uses a tool to scrape the ice cream off the cold surface and turn it into a roll. The rolls are then put in a cup and covered with fruit or flavored syrup. One serving costs about six dollars in most places in the United States. Thailand most often gets credit for the creation; a popular YouTube channel called “Ice Cream Rolls” reports that the dessert started there. Millions of people watch the channel’s latest videos each week. Asia has been coming up with new frozen treats for a long time. A recent New York Times article reported that “elaborate” frozen desserts were written about in Japanese literature nearly 1,000 years ago. Dan Friedell adapted this story for VOA Learning English. Ashley Thompson was the editor. Have you tried an ice cream roll before? What did you think? We want to know. Write to us in the Comments Section or on our Facebook page.